I'm getting rid of a few rare cars, this is the first. 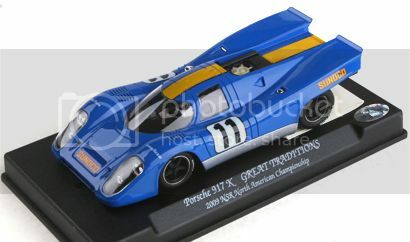 NSR has made only 140 of these special cars. New and un-run, photographed only. 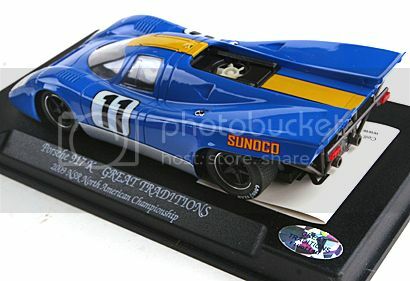 The NSR Sunoco Porsche 917, $200.00 plus shipping. Paypal only, contact via pm please. Gorgeous car, would love to buy it.....BUT, after dropping 2 bills, I would be too fearful of running it and it would be a waste to make it a shelf queen. Could buy it for "investment purposes", whatever that means. Dave, you have thrown a real curve ball here. Dave, you have thrown a real curve ball here. As a retired commercial photographer, your pics are first class...well done! I'd be afraid to run it too!!! Last edited by DaveKennedy; 05-08-2011, 10:38 AM. what lighting did you use for these pictures? Two studio lights, shot with a Canon G9 point and shoot.